While you may be prepared for many types of medical emergency, it’s common to forget about making sure you are covered for dental problems – and that’s a big mistake. Anyone who has ever had a severe toothache will attest to the fact that they can be downright awful. If you’ve got a toothache, and you can’t get to the dentist right away, you’ll probably be looking for a way to alleviate the pain. Here are ten home remedies that can help you treat a toothache in an emergency. Oil pulling is basically using oil as mouthwash. You place about a tablespoon of oil in your mouth, swish it around for a while – up to twenty minutes – and then spit it out. Coconut, sesame, and sunflower oils are commonly used for this purpose. While this remedy may seem like a new age technique it has actually been around for thousands of years. It has been used in Ayurveda, an Indian school of medicine, for many different dental issues. Today’s modern evidence-based medicine also suggests that oil pulling may be good for dental health. It works because the fatty coatings on the bad single-celled organisms in your mouth bind to the fats in the oils – so when you spit the oil out, the bacteria go with it. Clove is great for toothaches. On top of helping keep infection under control and helping reduce inflammation, this spice has the power to act as a numbing agent, helping with pain on contact. You can use clove essential oil applied directly to the sore tooth, ground clove made into a thick paste with the cooking oil of your choice used the same way, or you can chew whole cloves near the site of the pain. This remedy can be used a few times throughout the day. It’s very convenient to keep a cotton swab soaked in clove oil handy to stop pain as needed. Oregano is a herb commonly used for antibacterial purposes, and its essential oil is an ideal way to relieve toothache pain quickly. Put a few drops of the oil on a cotton swab and rub it around on the affected area. It may cause a bit of a burning sensation at first, but then it will help numb the area and the antiseptic and antibiotic properties of the oil will help reduce symptoms of infection. 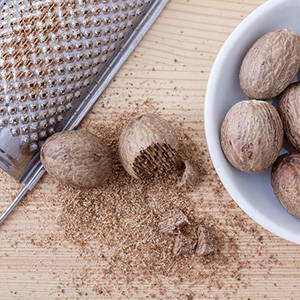 Like clove, nutmeg’s antiseptic properties and numbing capabilities make it great as a toothache home remedy. You can use it in exactly the same ways as clove; the whole spice, ground spice, or essential oil are all effective remedies. Colloidal silver, a suspension of silver particles in water, is a substance that is often used for its antibiotic properties. It can usually be purchased at a pharmacy or health food store. Mix a tablespoon of colloidal silver into a glass of warm salt water and gargle with it a few times a day for a few minutes each time to help eliminate toothache pain and inflammation. You can also apply it topically, dropping some onto a cotton ball, placing it on the affected area, leaving it for a couple hours, and then changing to a new cotton ball. Just be sure that you don’t take in more than the recommended daily dosage. Garlic is a very popular home remedy for infections of all kinds, and it’s thought to be particularly effective for toothaches. There are a few methods for using garlic to treat a toothache. You can crush whole garlic cloves and apply them plain or mixed with salt, or you can slice a clove thinly and apply one directly to the affected tooth. Other ways to use it include chewing a clove or two of garlic, or applying a paste of garlic powder, salt and water to the affected area. Also, you can apply diluted garlic essential oil with a cotton swab. Use garlic remedies up to a few times per day. Hydrogen peroxide is often used to disinfect wounds and to help get rid of budding infections that don’t yet require medical treatment. It can be used to treat toothache, as well. Simply swish a mixture of 3% hydrogen peroxide, either diluted 2 to 1 with water or on its own, around in your mouth for a couple of minutes. You can also let the hydrogen peroxide just sit on the affected area, as well. Then, spit it out and rinse with plain water to remove traces of hydrogen peroxide. Be sure that you swallow as little as possible. This remedy is simple and actually quite tasty. You apply vanilla extract to a cotton swab and then place the swab on the affected area. It helps numb the area, reduce swelling, and fight infection. The vanilla scent and flavor offer the added benefit of helping to soothe you. Salt water can help to keep infection under control and reduce inflammation at the site of a toothache. Simply mix a teaspoon of table salt, sea salt, or whatever else you have on hand into a glass of warm water and stir. Then, gargle with the mixture, swishing it around in your mouth with a focus on the painful area. Do this several times per day. Depending on what is causing your toothache, you may find that ice or heat can help. Ice can help reduce inflammation and heat can help soothe and relax painful muscles or joints. Use an ice pack or heat pack, covered and applied to the area, ten minutes on and ten minutes off for an hour to relieve tooth pain. This isn’t exactly correct. Colloidal silver made with nanoparticles of silver is chemically identical to any other colloidal silver; the particles are just smaller. If anything that makes the potential side effects more severe, or lets a smaller dose cause them. I know a lot of people believe in colloidal silver, but the fact is there’s no scientific evidence that it’s an effective treatment for ANYTHING. Balance that against the known side effects, and I’m pretty wary of it. Just to add to that, the only real medical property that colloidal silver has is that it’s antimicrobial. So is Tom’s bourbon. The bourbon is also cheaper, tastes better and won’t turn you blue. My daughter is a MD and she said some antibiotic ointments contain Colloidal Silver. If the FDA allows it, there must be some good in it. The FDA don’t allow it. It’s illegal to make any medicinal claims for colloidal silver. The internet is full of sites selling medicines that contain it, but none of them are FDA-approved. Claude, The FDA doesn’t allow a lot of good medical treatment that the rest of the world uses. They may not want you to use Colloidial Silver but they are studying it because it has been used for centuries and has proven itself. They just need patent-able products to approve so companies can make billions from it. The rest of the world doesn’t use colloidal silver either. The FDA have studied it, but they decided that, based on the evidence, it doesn’t treat anything. Every other drug licensing agency in the western world says exactly the same thing. I know a lot of people are fans of colloidal silver, but the fact is it belongs to the era when visiting a doctor made no difference at all to your chances of surviving a disease or injury. As soon as antiseptics and then antibiotics appeared, everyone stopped using it. There’s a reason for that. Claude, did you look at the above link? Studies show that using Ionic Silver in post surgical bandaging reduces infections to near Zero. These are US studies. Besides, the FDA won’t approve many proven cancer treatments that are accepted around the world such as Laetrile, chelation and induced high fevers. The stamp of approval from the FDA should not be a reason to not use or try anything. I personally know a man who was diagnosed with stage 4 prostrate cancer who refused chemotherapy. He cured himself with apricot seeds and Oxygenated blood transfusions. The FDA says apricot seeds(Laetrile) will only hurt you. Many people take them daily as a cancer preventative. Will it prevent cancer? I don’t know but I know it won’t hurt you if you take them at the recommended dosages. They can kill you if you take to many…but that is with all medicines. The FDA is another corrupt regulatory branch of our Govt. Silver kills bacteria; that’s well known, and silver-impregnated bandages are very common. That does not mean that all forms of silver have medical uses. Colloidal silver doesn’t treat anything, and it can have serious side effects. Laetrile is not accepted around the world. In fact it’s only really an issue in the USA, for some reason. The reason the FDA say eating apricot seeds can hurt you is that they contain potentially lethal amounts of cyanide. Amen to that! And don’t forget the World Health Organization attached to the UN. I’m starting to see recommendations coming out of that too. The law states that making any claims of beneficial medical results what so ever, means you are not marketing a food supplement or vitamins, herbs, etc etc. If you make a claim it counts as a drug, and all drugs must be studied, tested on humans, and then approved by the FDA, at which point the Big Pharma can choose whatever price and profit margin they want. Remember the guy with the injection pen for migraines was charging something like over 1,000% profit. When asked why he made it so expensive, he answered “because I can.” Some of the cures for Hep C are close to $60,000 for three month treatment. I don’t believe the cost to bring the drug to market was close to $50,000. I believe they know they’ve got thier hands around your,……..checkbook, and they have a monopoly many times, especially with new drugs. Go watch true story “The Dallas Buyer’s Club.” It blew my mind while I was learning all this stuff. If it’s not big $$$$, it’s not FDA approved. Period. Even if they have something that can keep you alive. I use bourbon on toothaches, soaking a painful tooth for 5 minutes before I spit it out. Start with 1 minute, build up to 2 over time, until you reach 5 minutes. Do this a few times a day for as many days it takes for the pain to quit. I suppose you could use vodka, but I have tried other alcohols, and bourbon, with its charred barrel aging, seems superior to me, but that is anecdotal. 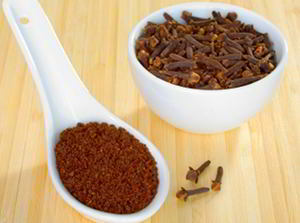 About clove, you missed one method, just put a clove or 2 between cheek & gum, and leave it there, all day if you like. 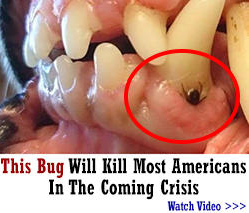 Unless one is allergic to Neosporin, in which case, you will develop really nasty sores on your gum. I have been using Neosporin since it was first introduced many years ago and three years ago, developed an allergy to it. Doctor assures me that is not unusual, lots of folk allergic to it. You might stock some zylitol. This naturally occuring sugar tastes sweet but delivers hardly any calories. Mouth bacteria eat it up and starve to death – hence it’s use in toothpastes, “mints”, gums and such. Sprinkle a pinch around the affected tooth and resist for a bit the impulse to swish it all around your mouth. Prickly Ash is a small tree with a fairly wide range in the U.S., commonly found along roadside fence rows. It has a lot of medicinal uses including chewing the leaves and bark for toothache. The seed is actually a variety of the Chinese spice Sichuan peppercorn. I use cheap white 100% Agave Tequila on toothache, swishing just about any liquor is the best treatment. The ultimate cure for toothache is having the dang thing pulled, of course. As Tom stated, hydrogen peroxide is no longer recommended for use by EMTs and other healthcare folks. Why? Because HP not only kills bad bacteria, but also kills healthy tissue. This has been common knowledge for MANY years. Do not expect to get the extra books that they say they will send if you order their books. I ordered the lost ways and NEVER received anything else. Their were other people in their blogs that expressed the same. The pictures are not color, so you can’t really see what the plant LOOKS like. The reading is interesting. That’s it. Umm, Did you try DOWNLOADING from the link? The second book is in color. As I sit here typing this I have an abscessed tooth that is not amenable to endodontal treatment. The only cure for the problem I am having with the tooth is going to be extraction. I can drink all the whiskey I want and that will only alleviate the symptoms, not the underlying problem. Yes, topical treatment can relieve the pain you are suffering from the dental problem but pain is only a symptom of the problem. Alleviating the pain doesn’t cure the problem. That is like taking aspirin for a broken leg — or drinking whiskey. Three ounces of 100 proof Wild Turkey will make the pain in your broken leg subside. You may even be able to walk on the break but your leg is still broken. Three ozs of 100° W.T. will definitely relieve your toothache, but if it is a nerve that is dying, it won’t help that at all. If it is an abscess that is causing the pain, ditto. The mainstay of modern dental care is the X-ray which allows the dentist to more accurately identify the cause of the discomfort and take appropriate steps to correct it. Dentistry 100 years ago consisted mainly of pulling painful teeth where no visual problem was identifiable. If not for modern dentistry, I most likely would not have any molars. And I am sure many of the readers of this post would be in the same situation. In an EOTW situation, there are going to be a lot more of us running around with a lot fewer teeth because we will once again revert back to the dental treatment available in the early 20th century or earlier. All of these “remedies” listed in the article are for pain treatment and will do nothing permanently toward solving the underlying dental problem, be it cavities, nerve damage from untreated dental problems or infection. If untreated, an abscess under a tooth will destroy the bone and eventually the tooth will fall out — nature’s way of curing the problem — tooth extraction by natural means. In the meantime you may well develop myocarditis from the infection which will also solve the problem because it will kill you. That’s a rather drastic cure. Humor aside, soak your tooth a few times a day for a few days. SPIT IT OUT ! ! If you want a drink, pour your turkey before or after. You’ll only handle a minute to start, work up to 2 minutes, 3 minutes, up to 5 minutes. See if it gradually gets better. Sounds like you ignored it way too long, this may do nothing for you, but it may give you comfort until you can have your teeth pulled. I hear you on the colloidal silver, Claude, but taking another instance, Sarah Westall”s YouTube guest some time ago, a doctor and researcher, found that mercury is highly toxic, and causes autism. I forget the details, but his research is suppressed and denied. We are operating under the premise that there is a global power that wants to rule us, and are actively damaging us to lower our resistance. Those powers have control at every level. When people speak of prepping, it is mostly to protect against these forces. They exercise control overy the FDA as well. They administer inoculations with mercury, used to be dead cells that our bodies would identify and make an immunity to the pathogens, but now they use live cancer tissue that they infect with pathogens, and they administer these live pathogens to us. Communities worldwide are being infected by their immunizations. When the Satanists lose control of the FDA, I will give them credence. We follow information–such as that from you, Claude–because these malevolent forces actively suppress the self-reliant, and self-determinant ways of the past, to make us wholly reliant on them. They seek to make us specialists, knowing how to install one widget, but be ignorant of the whole, making us wholly dependent on them. Those of us Christians see the prophecies from The Bible coming to pass, and they suppress that knowledge as well, attempting to create false faiths, even false scientific beliefs, to weaken us, make us ineffective, destroy us. Decimate us?, they want to take less than a decimated amount, and those would be the only survivors. They state in their, ‘georgia stones,’ that they want to bring the population to 500 million, killing fourteen out of fifteen. (They prize all-caps, such as in our birth certificates, passports, and drivers licenses, which is why I print their stones in lower case). Imagine if we were introduced to water today, “WARNING! ! HAZARDOUS TO YOUR HEALTH! !” (In miniscule type, drinking three gallons at a sitting of this has proven fatal to lab animals). I now see I didn’t get this sent. My childhood hero, Steve McQueen, died of cancer while being treated for cancer with laetril. Not all old remedies work. I would posit that most cures that involve a dead cat are probably ineffective, BUT… (The big but), my premise, we’ll documented, the AMA, the drug companies, deliberately avoid healing us, desiring instead to treat our symptoms, and maintain us alive to drain our resources. President Washington worked into the night in the wet, and became ill. He wanted to mend naturally, but Martha insisted on the doctors, who bled him to death. Why don’t you mention the toothache plant? Spilanthes oleracea.